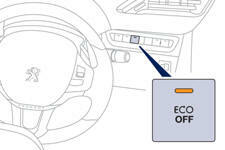 In the event of a fault with the system, the "ECO OFF" switch warning lamp flashes then comes on continuously. In the event of a fault in STOP mode, the vehicle may stall. All of the warning lamps come on. It is then necessary to switch off the ignition and start the engine again using the key.